Welcome to Auburn Park in Westmount, London! Right in the heart of thriving Westmount location, our community is home to professionals, families and those who love being in the centre of it all. Our luxury apartments offer newly updated one and two bedroom apartments, a seasonal pool, movie theater and party room for entertaining, tennis courts, and fitness center. Enjoy suites complete with features like vinyl flooring, ceramic tile and private balconies; our newly renovated apartments are everything you're looking for in a home. 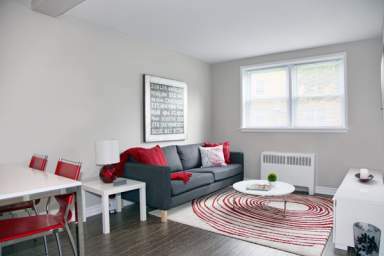 Life at Auburn Park is convenient, modern, bright... need we say more? Our one and two bedroom floor plans are appealing to a wide spectrum of lifestyles and needs. Located in the Westmount neighbourhood of London, Auburn Park offers a wide variety of amenities at your doorstep. Our modern and bright apartment apartment complex is sure to appeal to area professionals, families and couples, with a selection of upscale and newly renovated designs to choose from. Isn't it time you lived in a thriving neighbourhood close to the cultural and entertainment outlets you've craved? Call Auburn Park at 519-914-2782 today and set up a tour!